I guess my minddoes wander a bit among the faded flowers of yesterday's Mac computers.But I have my reasons for each choice - or perhaps weird aestheticreasons. The flat panel iMac has one of those weirdnobody-but-Apple-would-design-this thing going for it. Not only that,but it offers an incredible range of monitor adjustment. This issomething that only appeals to a bifocal wearing dweeb like me, buttrust me, my neck would love me if I choose this option. But the majorreason for using this sort of iMac is that it is just flat out coollooking. 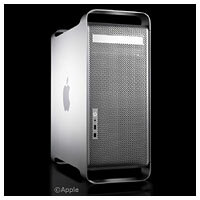 A Power Mac G5 would satisfy my lust for power - power that a G5processor could give me at a much lower price than an Intel box. Icould load up the G5 with several hard drives and gewgaws and feel likeMr. Power User. As far as buying the maximum pre-Intel Mac computer,the G5 is the way to go. It could be expensive if I wanted a dualprocessor model over 2 GHz, though. A cheaper direction would be to pick up a Mirrored Door FW800G4. The G4 might not be as fast as a G5, but do I really need that muchprocessing power? Yes, I could pretend to get a G5 tower and look likeI need to move huge files and process fractals or something, butrealistically, a G4 Mirror Drive Door could probably do what I wantedat a much lower price. A PowerBook is not a desktop computer, you might say - and you'd beright! But I think that I have argued in the past that using a laptopas a desktop makes a certain sort of sense. No one would pretend thatyou can use a desktop as a portable computer, but a 17"PowerBook gives you a big enough screen (1440 x 900 resolution) andenough power (1.0 to 1.67 GHz) and connectivity to pass as an adequatedesktop. Besides, when I someday score that digital SLR, I will need a laptopwith a big screen to edit images. I also have a 160 GB notebook drivethat remains unused at this time. Of course, all of this requires funding. I feel that the time hascome for me to try out Leopard and see if the push feature of MobileMeis up to the task of keeping my iPod and a Leopard computer in syncall the time.